Our knowledge of the heliosphere in three dimensions near solar minimum has advanced significantly in the last 10 years, largely as a result of the on-going ESAINASA Ulysses mission. Similar advances in our understanding of the global heliosphere near solar maximum are to be expected with the return of Ulysses to high solar latitudes in 2000/200 I. 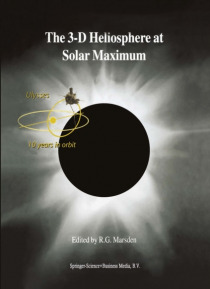 With this in mind, the 34th ESLAB Symposium, held… at ESTEC in Noordwijk, The Netherlands, on 3-6 October, 2000, was devoted to 'The 3-D Heliosphere at Solar Maximum'. This was the third ESLAB Sympo- sium focusing on the three-dimensional heliosphere (previous symposia being in 1985 and 1994), and the timing was particularly appropriate, marking as it did the 10th anniversary of the launch of the Ulysses spacecraft. Furthermore, Ulysses had just started its third high-latitude pass, the second over the Sun's south polar regions. The symposium addressed a wide range of topics related to the solar-maximum heliosphere, with presentations on many of the latest findings from Ulysses and other space-based missions. Ground-based studies and theoretical modeling were also well represented. Specific questions to which answers were sought included the following.